Combine the Gauge Guard Protector with a quality Gauge Guard Isolator Gasket to achieve complete diaphragm protection! A necessary and cost effective step in assuring maximum service life and accurate results from your instruments and gauges. 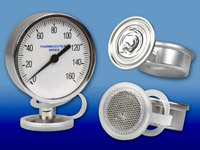 Gauge guards protect, isolate, and insure expensive, fragile gauge diaphragms and other similar instruments from damage during calibration, routine maintenance and during autoclave procedures. Gauge Guard Protectors are available in 3/4", 1", 1-1/2" & 2" Sizes and are manufactured using U.S.P. Class VI Platinum Cured Silicone with a 316 Stainless Steel mesh.